We all celebrating International Women’s Day 2018, i.e. 8th March, 2018 and there are numerous roles a woman plays, as a daughter, a mother, a sister, a Grandmother, a friend, a lover, a wife and more over she also plays some iconic role in this society, as an entrepreneur, as a business head, educator and inventor, etc. 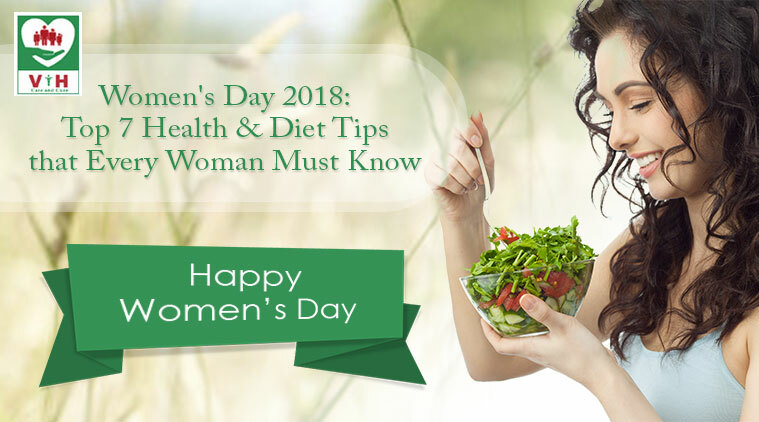 In this Women’s Day, Venkataeswara Hospitals is the best Multispeciality Hospital in India, want you to take a break and listen to this health tips which helps you to be a healthy women for everyday life. Before getting into the health tips you must read this Guide to Keep Your Heart Healthy!!!!! Breakfast is the most significant feast of the day; it is not matter how busy you are, get some time to healthy and heavy breakfast which is full of proteins that keeps you energetic throughout the entire day. Just taking dietary food will not make sure a healthy body, to keep healthy body do some physical activity or exercise every day. Avoid spending your time at the gym; just take 30 minutes of your favorite outdoor sport, running, walking, can help you out. Water is the one of the best solution to all your health problems; Yes! It helps wash out the dangerous toxins formed in the human body due to poor eating behaviour, inactive lifestyle. Along with water, add some lemon and honey to make it healthier. Water is not only kept your body hydrated, but also will keep your skin glowing always. As a woman your skin also needs some healthy attention! Instead of using your chemical-laden commercial skincare products try to use healthy natural ingredients. Adding healthy natural ingredients will help you get a shiny skin. Most of the women’s ignore to go for the body check up in order to take care of others in the family. So take some time and get your body checked for any doubtful growth or anything that you think should be resolved before it gets to danger. If you are an occasional drinker then it is fine, making this smoking and alcohol as a routine habit is extremely dangerous. Smoking and drinking not only cut short your lifespan, but also it makes you to look elder and dull. Nowadays, most of the human being has suffered from having stress and one cannot avoid considering the many pressures in personal and professional life. Adding a bright coloured fruits and vegetables in your food diet that will help cheer up your mood instantly. On this day Venkataeswara Hospitals, the leading Heart Hospitals in India, advise you to keep following all these basic health and diet tips to go ahead a positive, fit and long-term life forever.